Children and Chihuahuas can get along! Children are unpredictable and active. I should know, my daddies just got two temporary foster kids. Their ages are 4 and 6. I don’t know how long they’ll be staying. At first I was hesitant. I knew little about children other than that they tend to come up to me in herds and squeal, sticking their hands in my face. But these two guys are mostly well-behaved and easy to play with. They keep me company and sometimes throw the ball or toy for me. I have to watch after them. They need as much supervision as my daddies. You must teach your children how fragile a Chihuahua is. I also recommend you don’t leave them alone together. I have been grabbed and picked up by both the 4 and 6 year old boys. I admit I did growl a few times, just as a warning. Introduce your children to your Chi. Let the Chi get to know them. Don’t touch. Children can easily break your Chi’s legs. Don’t hold. Children can drop the Chi or hold them the wrong way. Don’t feed. Children don’t understand that certain foods, like grapes, raisins and chocolate, can kill your Chi. After a few mishaps, my daddies are very diligent about feeding the kids these forbidden foods around me. Don’t drop. Please don’t. We break. Don’t tease. We hate being teased and will let you know it. I am probably the exception to the Chihuahua rules. Perhaps because I’m a bit “grande”. Still, a 10 pound dog is a delicate creature too. That said, I love my new family of kids, even if they’re only temporary. I look forward to seeing them and playing with them. I also know when to keep out of the way. When it comes to Chihuahuas and children, proceed with caution. 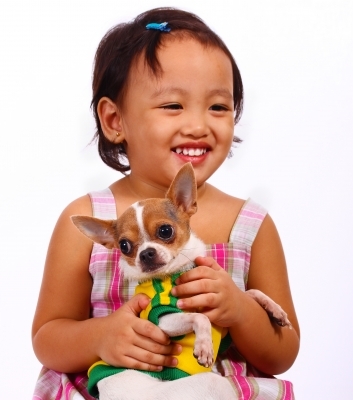 You may find the following articles helpful on dealing with children and Chihuahuas. Is the Chihuahua Right for Me? Follow Lucy on Twitter and like me on Facebook too! Subscribe to Lucy’s fun-tabulous newsletter.